The Blair government should have "sorted out" its plans to rebuild Iraq after the war much sooner, an ex-minister has said. Sally Keeble said the Department for International Development's role was still under debate "close to the action" starting in 2003. There was also a "problem" with the UK's military and aid roles not being focused enough on one area of Iraq. 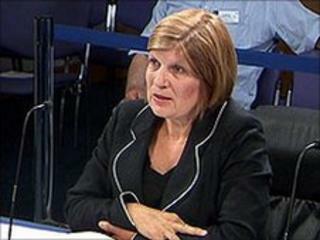 Ms Keeble told the Iraq inquiry "real issues" had arisen over money. The investigation is looking at the UK's role in the lead-up to, conduct of and aftermath of the war, which began in March 2003. On Monday, the inquiry released a previously classified letter from Ms Keeble to former Prime Minister Tony Blair, written shortly after she left the international aid department (DfID) in June of that year. In it, she accused her former boss, the ex-International Development Secretary Clare Short, of making "disastrous decisions", leading to failures in planning and creating difficulties in providing humanitarian supplies. Ms Short resigned from the government shortly after the invasion, citing a lack of United Nations involvement in the reconstruction effort. In her letter, Ms Keeble said she had also planned to quit, but this had become "impossible without getting muddled up with her [Ms Short's] political agenda." The government forwarded Ms Keeble's concerns to DfID, whose permanent secretary, Sir Suma Chakrabarti, in reply, described them as "serious - but unfounded". He added that she had had "every opportunity" to raise concerns during her time as a development minister but had declined to do so. Questioned about the letters by the Iraq inquiry, Ms Keeble said debates about the department's job had still been raging shortly before the invasion. She said: "This was one of the issues that should have been sorted out much earlier... There were a number of crucial issues that were still being debated." Ms Keeble, former Labour MP for Northampton North, added that she had believed the UK government should focus its efforts, both military and in aid development, to one geographical area of Iraq to ensure a coherent and consistent approach. "It just seemed to me that, if we were having that debate in the middle of February, so close to the action, it was hard to do any planning around any other logistical support." The Iraq inquiry restarted its public hearings last week after a break of several months. It is expected to report on its findings later this year.